Whether the Calgary Flames declare it or not, David Rittich is their number one goaltender. He’s started five of the last six games and was brilliant in Thursday’s 4-1 road win against the Winnipeg Jets. He has also faced more shots than Mike Smith and played against the toughest opponents. The goalie – who entered the matchup with an 11-4-2 record, 2.29 goals against average (GAA) and 0.923 save percentage (SV%) – improved his numbers to 12-4-2, 2.22 GAA and 0.926 SV% following the 35-save performance. The Jets came out firing in the opening period. They had a 14-7 edge on shots on goal during the first stanza, but no goals. Rittich kept the Flames in the game. By the time Adam Lowry scored the tying in goal in the second period, Calgary’s netminder had already accumulated 23 saves. 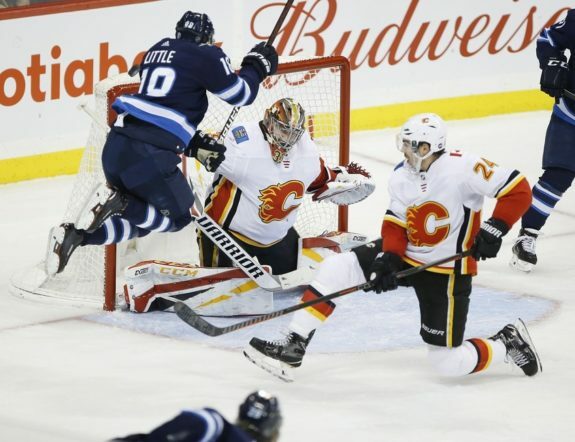 Some of these stops included a smooth glove save on a slap shot from the point by Dustin Byfuglien, as well as blocker saves on Nikolaj Ehlers and Patrik Laine. The former split the Flames’ defense and the latter was stopped from point-blank range. Mark Scheifele tried to go five-hole but had no luck. It was Rittich’s night. Yet, he saved the best for last, a sprawling save after Byfuglien found Bryan Little for a one-timer midway through the third period. 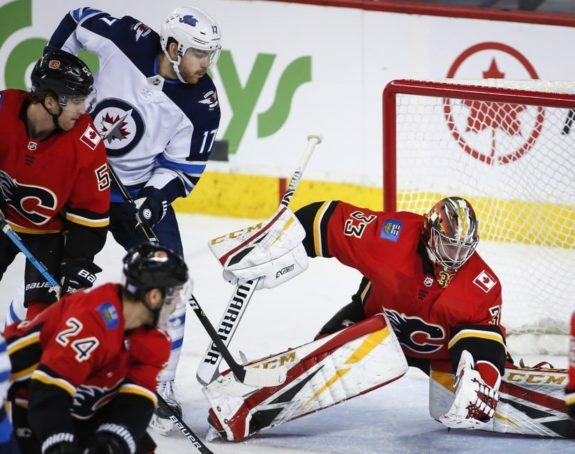 Living up to their offensive prowess, the Flames made the necessary adjustments while their goalie kept them in the game. Johnny Gaudreau found the back of the net for the first time of the evening one minute and four seconds into the second period. He tallied another two to notch his fourth career hat-trick. On Saturday against the Vancouver Canucks, Rittich wasn’t outstanding per se but was solid enough to give the Flames a chance to win. Calgary didn’t pull it off, though. Alex Edler scored the game-winning goal in overtime and the Canucks won 3-2. Rittich’s numbers are 12-4-3, 2.26 GAA and 0.924 SV%. Someone in the Flames organization did a phenomenal job scouting Rittich. The goaltender didn’t have the most eye-popping numbers in the Czech league but has been money during his tenure in North America. “Someone” means Flames’ director of pro personnel Derek MacKinnon and goaltending coach Jordan Sigalet who were at the O2 Arena in Prague three years ago. MacKinnon was specifically scouting forward Daniel Pribyl – also signed by Calgary – but Rittich quickly stood out by stopping several breakaways. In short, the Flames found a difference-maker out of nowhere. More from his story in the Czech Republic can be found here. The Flames signed Rittich in the spring of 2016. He made his NHL debut in the final game of the 2016-17 season, a 3-2 loss to the San Jose Sharks, playing in the final period in relief of Brian Elliott and stopping nine out of 10 shots. Last season, veteran goaltender Eddie Lack struggled in the backup role, paving the way for Rittich to become a full-time NHLer as a backup to Mike Smith. In relief duties, the Czech netminder made 21 starts in the 2017-18 campaign, posting an 8-6-3 record, 2.92 GAA and 0.904 SV%. Beloved by his teammates, he’s quite the character and brings a high energy personality to the dressing room. Last month, he sat down with Sportsnet’s Ryan Leslie and Louie DeBrusk on After Hours to discuss not only his path to the NHL, but also his nickname and peculiar interests, such as steak and Coca-Cola consumption. After 39 games in 2018-19, Rittich started 22 times and is solidifying himself as the team’s number one goalie, despite no public announcement from the Flames. Given Smith’s struggles, some wondered if the Flames would search for a serviceable backup for the second half of the season. But little can be expected in exchange for an aging goalie in his waning years and on an expiring contract. General manager Brad Treliving will need to be creative if this is the road taken. Rittich has been one of the many positive storylines of team’s season. However, there are more than 40 games to go and things can turn quickly. But so far, the Flames are happy with Rittich making most of the starts and hasn’t shown signs of slowing down. New Year’s Eve is right here and the Flames have a marquee matchup against the San Jose Sharks at the Scotiabank Saddledome with big divisional implications. The winner will move to first place in the Pacific Division. To nobody’s surprise, Rittich will be between the pipes. Among starting goalies in the league, Big Save Dave (his nickname) is fourth in GAA and fifth in SV%. Going back to him as much as they can is a no-brainer at this point. San Jose hasn’t announced yet, but looks like Aaron Dell will get the start. He’s 5-4-3 with 0.904 SV% and 2.69 GAA. After 39 games, the Flames have scored 133 goals, fourth in the league. Their 105 goals against are tied with the Washington Capitals for the sixth fewest in the league. Calgary has five players among the NHL top 50 scorers as of Dec. 30, most in the NHL. The quintet: Gaudreau (sixth; 51 points), Sean Monahan (tied for 21st; 43 points), Matthew Tkachuk (26th; 42 points), Elias Lindholm (tied for 27th; 41 points) and Mark Giordano (tied for 44th; 36 points). The Flames have a positive record against every division. Here is where they stand after 39 games: Atlantic Division: 6 games, 3-2-1; Central Division: 16 games, 11-4-1; Metropolitan Division: five games, 3-1-1; Pacific Division: 12 games, 6-5-1.